Marine engineers at times lack the confidence to tackle electrical problems. This six days "electrical applications" course is aimed at problem solving on shipboard electrical problems. It deals with basic electrical equipments, safety requirements, power generation and distribution. 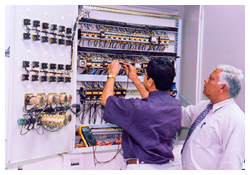 Practical sessions are carried out by participants in AEMTC's 'Automation lab' on direct 'Online starters', 'Distribution board', 'shipboard circuits, 'stardelta changeover' and various shipboard electrical panels . This course is tailor-made for shipboard applications. A hands-on approach is followed throughout the course with numerous practicals carried out by the participants at the "Automation Lab". 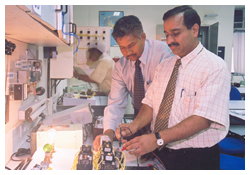 This Course is focused on fault finding and trouble shooting of various practical Shipboard electrical circuits. Fault finding and trouble shooting exercises. Practicals on direct ON-LINE starters. 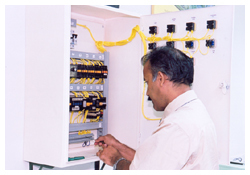 Proper maintenance & care of electrical equipments. Practicals on Electrical Measuring Instruments. Practicals on Star- Delta starting circuit. Care and maintenance of M S B & E S B. Personal Safety awarness when working with Electrical installation. Study and Analysis of complicated shipboard electrical diagrams.